Many, if not most, black bass anglers value bigger and heavier fish, over the more numerous juvenile bass, but it’s important to the quality of bass caught, and even how size relates to fishery management. Natural mortality is key. While large old bass may have a slightly greater natural mortality rate than younger adult bass, overall mortality rate of juvenile fish is greater. Most bass spawn between 5,000 and 12,000 eggs per nest. Of these, only two would need to survive to adult size to maintain the size of the adult population if each pair of bass spawned only once. Only one must survive per nest if adults spawn twice, and adult bass frequently spawn three or more times. Typically, egg, fry, and juvenile mortality is high, more than 99.98 percent. The size of the spawn is seldom the main factor determining the size of adult bass populations. Almost always the number of bass in the adult population is determined by suitable habitat, ample nutrients, availability of prey of suitable sizes, favorable water temperatures, and seasonal length and stability. The size of bass determines how they feed and how vulnerable they are to predators. Born with an instinct to eat anything moving small enough to fit inside their mouths, tiny fry are relatively immobile, are easily caught and eaten by predators, feed only on food immediately in front of them, and are basically limited to small plankton. Feeding success depends largely on the density of planktonic food in the nesting area. As they grow to fingerling size, mobility and mouth size increase. Diet expands to include larger plankton, like Daphnia, small insect larvae, and even smaller bass and other fish. Food density in the spawning area becomes less critical to continued survival. Fingerlings move to find more food. This behavior spreads the future adult bass population away from spawning areas to find other suitable habitats. Gradually, fingerlings move to occupy main-lake points, creekbeds, and deep-water structures that offer sufficient food. As fingerlings grow they remain highly vulnerable to predators, but the type of predation tends to change. Larva, fry, and small fingerlings are heavily predated on by insect predators, sunfishes, and slightly-larger juvenile bass. By the time they reach 2 to 3 inches, predation by birds like herons and larger bass increases. As fry, schooling behavior is critical, primarily as a defensive technique because individual fish are easier targets for most predators. The downside of this tactic is that there is often less food per individual in schools. In tight schools, only the leading edge of the school tends to get much food. As small fish spread out, they individually tend to get more plankton. While schooling as fry, tiny bass often first experience open-water feeding as they follow plankton concentrations into open water. An open-water feeding experience by fry can lead them as fingerlings to suspend and feed on smaller fish in open water. If there is no significant predatory threat in the pelagic zone, juvenile bass quickly learn to move offshore to feed on juvenile shad or herring. But, abundant larger, open-water predators like hybrid striped bass and striped bass often make this experience too hazardous, limiting suitable habitat to shoreline cover, coves, or cover on structures near shallow water. Fingerling mortality rate is usually high—50 per- cent or more a month—but less than that of fry. Juvenile bass become more adept at escaping predators. Most of an original school of 500 to 1,000 fry has been reduced to an aggregation of 50 to 100 fingerlings. Still, there are a lot more small bass than the required average of one or two per nest. As fingerlings, bass continue to get defensive benefit from schooling, but feeding in smaller groups or aggregations offers more food to individuals. Fingerlings learn to feed aggressively, to chase down fleeing targets, and to “cooperate and graduate.” Flushing becomes their primary hunting tactic. As numbers are reduced, larger fingerlings continue to move as a group, but not in coordination like a true school. The prey one bass startles are more easily caught when they flee into the strike zones of nearby bass. Teenage bass, 6 to 11 inches, continue to feed using the flushing technique. They maintain the juvenile tendency to feed constantly and are active and catchable by anglers throughout daylight hours. They have not yet learned to conserve energy for times when feeding is optimal, although learning this need may already be underway. Teenagers continue to eat smaller fish, crayfish, aquatic and terrestrial insects, frogs, and other items, but the primary foods of juvenile and adult bass are smaller fish. Even smallmouth bass adults feed primarily on fish if smaller and catchable fish are abundant. Hungry and actively feeding teenage bass are best targeted with small fish-like and insect-like baits, perhaps even those with small dots of colors that simulate plankton. As most prey are small and relatively immobile, effective presentations likely feature shallow glides and tiny shivers rather than more aggressive and speedy retrieves. Fingerling and teenage bass are in a period of intense feeding. All food intake is devoted to immediate life support and growth. In dense food environments, bass may grow to 12-inch adult length in one year. The fastest-growing juveniles can reach 12 inches in only five months. In more typical feeding environments, it may take another year to reach adult size. In most waters, bass become adults the year after they were spawned. Infertile environments may force bass to reach maturity in 8,192 three or more years or to spawn when only 10 inches or so long. The most harvestable bass are 12to 14-inch adults. They provide fillets of decent size, are the most abundant size in many bass fisheries, and also are the most easily caught adults. If management desires harvest, these are the bass most likely to be in oversupply. Removal of some small adults often has little effect on the total adult population. Removal of a few bass of this size allows other small adults to survive, and the total mortality rate is not substantially changed by harvest. There is often an excess number of bass in this size range, particularly in fisheries where past harvest rates or mismanagement has created imbalance, stunted juvenile bass, or there is insufficient food for larger bass. When a fishery fails to produce an appropriate number of larger adult bass, release of small adult fish can be harmful and maintain stunting. Effective fishery management should insist excess small adults be harvested rather than encourage catch and release of small fish. This situation is often the reason managers opt to use slot limits. Stunting can be a common situation in ponds and small impoundments with excessive bass recruitment. Adult bass have a new set of problems and requirements. From maturity on, much of the total food intake is devoted to sperm and egg production, and spawning consumes more of the yearly energy intake. Growth in weight and length slows. While juveniles grow 4 to 12 inches a year, even well-fed adult bass typically grow less than 3 inches a year. Low food supplies result in slower growth. It is in the adult phase of life that bass must learn to conserve energy. Fat reserves are critical to egg and sperm production in fall. There is seldom energy to waste. Adult bass either learn to wait for optimal feeding conditions or perish. Fishing for adult bass requires greater knowledge of times and places where bass congregate to feed. Adult bass are more likely to be inactive, forcing less knowledgeable anglers to either catch juvenile fish or go fish-less. How much of this behavioral change is instinctive is undetermined. Adulthood is also the time when bass learn about anglers. They learn to avoid noises, waves, and vibrations created by fishing boats, trolling motors, electronics, water-pumps, lure splashes, and even the sights and sounds associated with frequently used lures and lines. Experienced bass become harder to catch, and the widespread practice of catch-and-release provides a lot of learning experiences. The natural mortality of adults due to predation by larger fishes is reduced to a minimum, from an optimum of about 15 percent per year in ideal environments to as much as 60 percent a year in unhealthy, unfavorable environments. Thirty percent per year is a typical natural mortality rate for adults. If there is additional harvest or catch-and-release mortality, it increases mortality rates. 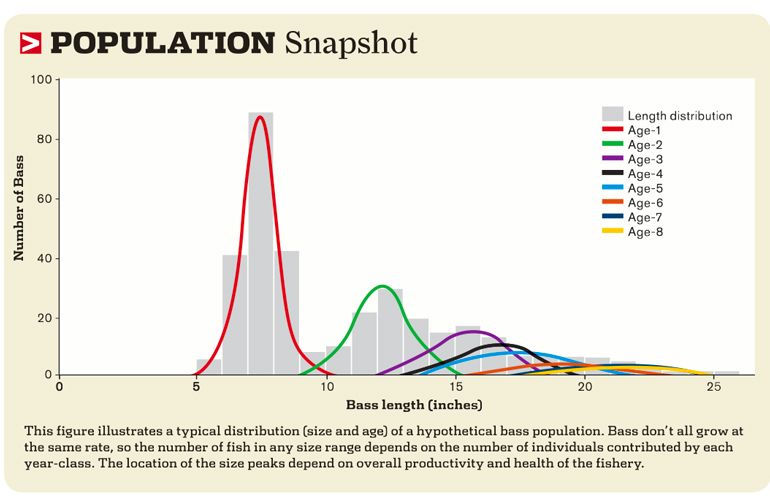 The existing population of adult bass is as large as it is going to get. A year-class can never increase. Many predator fish species hold basic body shape as they mature and age, and more muscle means more speed, more stamina, and more power. But adult largemouths, particularly females, tend to grow disproportionately fatter and less streamlined, particularly as females gain weight above about 5 pounds. While lunker bass may have more muscle and be theoretically stronger than smaller adults, they have little more stamina than 5-pound bass. They accelerate slightly more slowly, tend to cruise more slowly, and use more energy due to bulk and greater inertia. Old and large bass are almost forced to change lifestyles. The harassment of spawned-out females by eager yet-to-spawn males forces females away from spawning areas. Some females may suspend offshore, while others may move to or return to home ranges in deeper water. This may help explain why larger bass are often found deeper and away from shallow cover. Most of the contemporaries of lunker bass (bass in the 24-inch-and-larger category) are dead due to accumulated mortality. They have become rare. Lunkers find fewer and fewer bass of similar size with which to aggregate and feed. The flushing and offshore feeding tactics that were their predominate feeding methods as young adults become difficult, if not impossible, now. Little adults are unlikely to try to feed with any fish big enough to eat them. Lunkers become loners, mainly for lack of partners. As loners, it is more important for these special bass to find optimal habitats where prey are abundant enough to be caught by a lone bass by using short-strike, semi-ambush tactics and low-light or nighttime feeding. Lunkers are more likely to be lurking under cover or in shade than younger more agile bass. Trophy guides concentrate on key, optimal habitats with ample cover and prey, or focus on key feeding areas unique to each habitat. Super-lunkers may be concentrated near places trout are stocked or be found suspended and cruising open-water where smaller predators are attacking schooling prey. Others may be found in key areas where current concentrates vulnerable prey, or feeding in funnel shorelines at twilight or after dark. Although lunker mortality rate is not as great as that of fry and juvenile fish, mortality does eventually reach 100 percent due to old age, disease, and parasitism. Big fish are rare and the most valuable fish, particularly if having trophy bass as anglers’ targets is a management consideration. Even with a high rate of catch-andrelease, harvest of even a few big lunkers can change a fishery’s potential. Good management requires nearly total conservation of the largest fish. 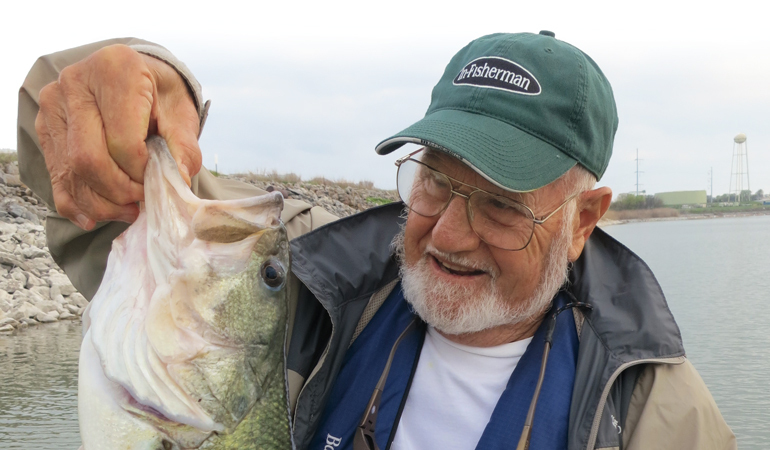 *Ralph Manns, Rockwall, Texas, is a longtime contributor to InFisherman publications, particularly on science topics involving black bass. He’s a lifelong passionate bass angler and observer of bass behavior.